During an operational tour a soldier gets a 2 week leave break…to come home, rest, see family and friends, for Madison this has come a couple of weeks before the trek! 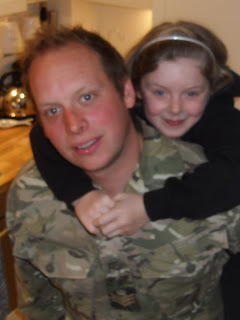 Her daddy returned last week and goes back to Afghanistan next week and she has loved having the opportunity of showing him all they have achieved and all the bits in the scrapbook and of course the blog! Tony also did some filming with BFBS TV forces welfare http://www.bfbs.com/news/topics/forces-welfare we will post the link of course after the piece is shown. 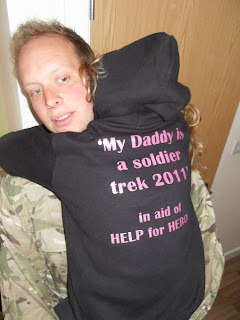 Here daddy of a Little Trekker blogs about coming home and what he thinks of the ‘My daddy is a soldier trek 2011’ and how important the focus has been for the little girls…. “Well it’s good to be home seeing my girls and to have a relax. Didn’t last long as we had some filming for BFBS and I saw first hand how long it takes to get two minuets of footage. I try to keep up to date with all the stuff that is happening with The Little Trekkers but actually what I see on the internet is only a fraction of what happens and actually the work that goes on behind the scenes by Louise and the other mums is unbeilevable knowing that Lou holds down a full time job and looks after a seven year old, how the trek and HomeFront Forces have had the coverage they have had is amazing.